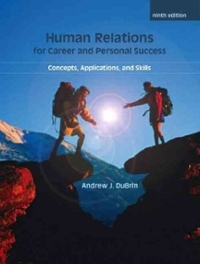 Human Relations For Career and Personal Success 9 Edition Human Relations for Career and Personal Success: Concepts, Applications, and Skills, Ninth Edition, shows how you can become more effective in your work and personal life through developing your human relations skills. Emphasizing different aspects of human relations, the text covers such topics as career advancement, developing good work habits, and managing stress and personal problems. Though designed to fit human relations courses taught in colleges, career schools, and vocational-technical schools, the text is also ideal for managerial, professional, and technical workers who want to improve their workplace and personal relationships as they forge ahead in their careers.